WCB, CF8, CF8M, CF3M, CN7M，4A， 5A, etc. For some very hard particles or serious erosive mediums, general metal seated wedge gate valves will be washed out and damaged easily due to the abrasion and or corrosion. 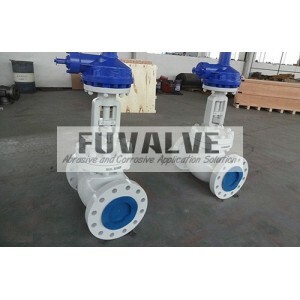 As a professional and experienced ceramic valve manufacturer, FUVALVE developes ceramic wedge gate valves to solve the corrosion and abrasion problems for wedge gate valves. 2. Inlet seat and outlet seat are ceramics materials. By using the high hardness and high strength of high pure 99% Al2O3 ceramics, FUVALVE ceramic wedge gate valves have much longer service life than general metal seated wedge gate valves in similar conditions. 4. The actuation of FUVALVE ceramic wedge gate valves can be hand wheel, electric motor and hydraulic actuator, special requirements are available on customer’s require.